A unique opportunity has arisen to purchase “Muncaidh House”, a stunning new country home of over 400 sq m, architect designed using state of the art building techniques and offering an impressive degree of energy efficiency. Muncaidh House (meaning “monkey house”) is located in a peaceful rural location at the edge of the village of Gateside, about 30 minutes drive from Glasgow. It is set within its own newly landscaped grounds, and has equestrian facilities and grazing. 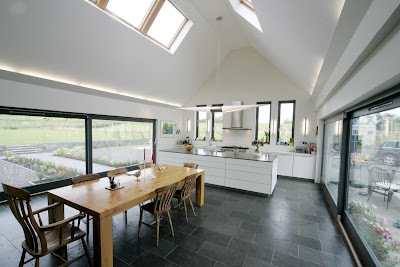 The house has been built using structural insulated panels, a modern method of construction, creating an extremely well insulated home which not only benefits the environment but means energy costs are greatly reduced. Central heating and hot water is provided by a borehole ground source heat pump, an efficient and environmentally friendly solution, widely used in Scandinavia. There is under floor heating on the ground floor, and a heat recovery unit also improves the efficiency and ventilation of the house. 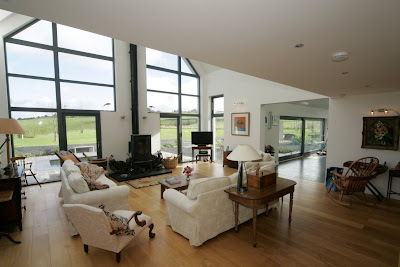 Integral to the design of Muncaidh House is the emphasis on light and internal space. 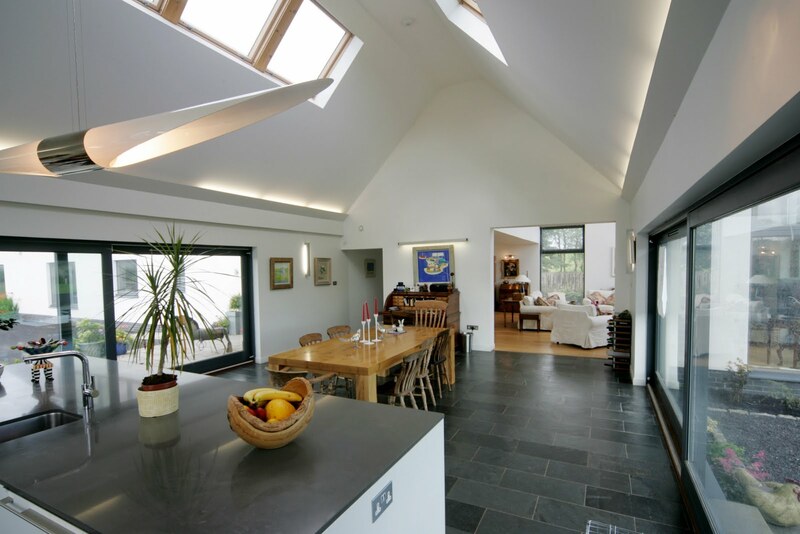 The careful use of man-made materials, softened by the use of natural products such as timber and slate, provide a backdrop to the stunning interior. The design incorporates floor to ceiling windows in the main reception rooms, and careful thought to the layout has resulted in a wonderful semi-open plan family living space. 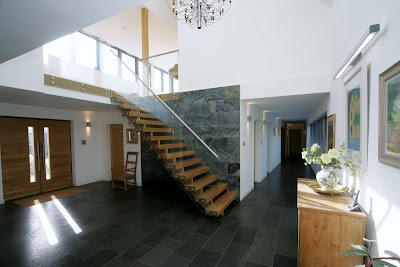 The central feature of the house is the grand entrance hall (above), with its spectacular timber and glass staircase, and a wall of folding doors opening into the 24ft living room. 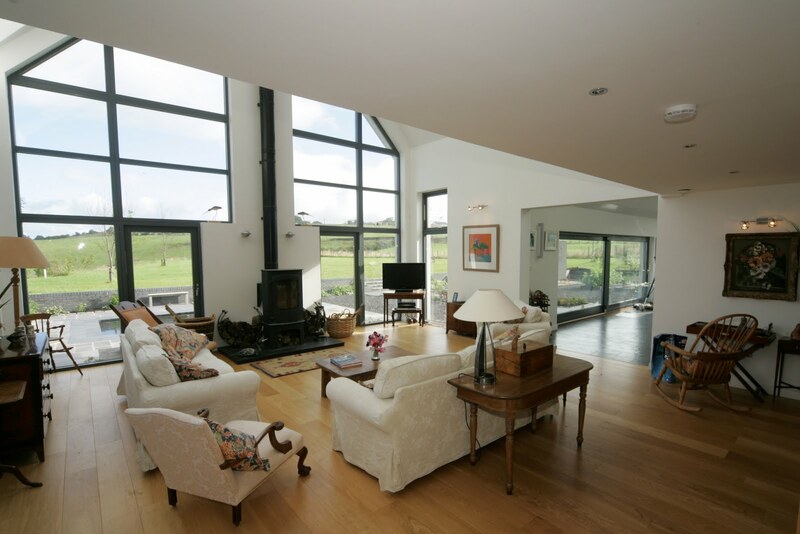 This stunning space has a full double height wall of windows, and a multi-fuel burning stove giving a central focal point. From here a wide arch leads to the kitchen/dining room (above and below), where the design of the house comes into its own. It has a vaulted ceiling, with velux roof lights and full height patio windows taking up most of two sides of the room. To one end is a modern fitted kitchen with fully integrated appliances, whilst the remainder of the room forms a welcoming sitting/dining area. The reception rooms also include a private study, large studio and a private family room. Upstairs the landing is lit by windows in the roof and along one side of the house. The master bedroom is a sunny south facing room, with vaulted ceiling and twin windows with Paris balconies. It has an en-suite bathroom and walk in dressing room. There are three further bedrooms, one of which has an en-suite shower room, and a generous family bathroom. Outside are landscaped gardens and a substantial garage block. For equestrian enthusiasts, there is an enclosed stable yard, outdoor arena and around 5 acres of grazing. An additional 16 acres may be available separately. 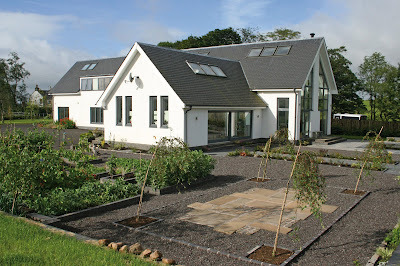 Muncaidh House is a wonderful opportunity for anyone looking for a unique and substantial country home, with all the benefits of a state of the art, eco-friendly design. Offers over £695,000 are being sought for Muncaidh House.